As a purportedly aloof and wise wizard and a dutiful five-year student of the I Ching, I am not supposed to play favorites. Then again, part of what makes me such a great New England renegade in the shadow of Monadnock is that I do things I’m not supposed to do all the time. In accordance with this, I declare to you today that the eighth hexagram is just a real gem. It’s a phenomenal illustration of the most natural and ideal relationship between ourselves and others, and between all of us and leadership and government. It’s not a picture of crookedness and corruption and fallibility but a colorful portrait of the way that things should be—and the way that they can be. Water flows together. Water flows into other water and unites with it. This is not mystical or imaginary. Streams and brooks flow into rivers and pool into ponds and lakes before overflowing into other streams and brooks flowing into rivers eventually emptying out into seas and finally into the broad ocean that encompasses the unity of the world. In this same manner, let us unite with one another. We’re all, after all, comprised of water. We are the water, just as we are the light. The natural procession of human affairs, however, also includes the influence of strong leadership upon the waters. 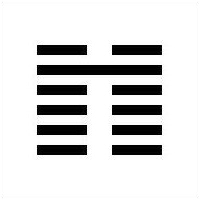 This is not the tyranny of the despot, nor is it even the benevolent and steady discipline of the good general depicted in the previous hexagram. This is something higher, something more fundamental and pure than those manifestations: leadership that not only guides but unites with the people in a way that completes the people. Leadership that manages and rules over the people must definitively exist as separate from the body of the populace. Leadership that completes the populace and provides what is needed for the most holy unity of all is at the center of the body of the populace. This is the kind of government that ensures the effectiveness and actualization of our unity, the exact opposite of the (much more common) type which fragments the population—or, at best, exploits the fragmentation already extant within the population—in order to consolidate and hold a very petty kind of power. In the previous hexagram, we are shown that a primary role of government is to ensure the economic prosperity of both the country as a whole and all of its citizens as individuals. Not to be outdone, the present hexagram informs us that the most important function of government in society is to ensure that every single individual holds a real and meaningful role within that society. Think about that for a moment. What a concept! The primary function of government is to make sure that every single person is not merely a documented paper citizen but a member of the society. This could, of course, be said to be the very actual definition of citizenship itself, but when I’m not occupied, variously, by being a wage slave or a wizard, I spend my time following and studying politics and government, and I can say for a certainty that virtually no one is advocating for this kind of government. And I only say “virtually” because I’m allowing myself a small error or two of omission; off the top of my head, I can think of exactly no one, whether elected official or paid pundit, on either “side of the aisle,” who is making this argument in any kind of cogent or consistent manner. Naturally, it’s easier said than done, but how much more basic can it get? If the people, especially within a diverse circus of interests, unite like the earth’s flowing waters and are led to understand their membership in and importance to the ocean, won’t everyone in turn understand that even their individual interest lies in their active loyalty to it and participation in it? What more blessed society, what more complete unity of individuals, can be imagined? So maybe it’s easier said than done, but what specific knowledge can help us get there? First of all, we can recognize that the relationships we form make up the foundation of our society as a whole. If we come together on a small scale on the basis of honesty and openness, without guile or ulterior motives, it provides such a strong basis for union on the large scale that it will actually attract good fortune to it from the cosmos itself. Next, we must never forget that the shameless panderer, the ambitious climber caring for nothing but that next rung, will always lose his or her own self. The alternative presented to us is to be open to the active citizenship we know is possible and to persevere in forming the honest bonds mentioned above. At the same time, we shouldn’t get lax with the notion that union with those around us is unconditional or (from our finite perspective) universal. There will, it is certain, be times when we are surrounded by people with whom we actually don’t belong, with whom a true society isn’t actually formed. This is important to recognize, and while it’s just fine, even correct, to be pleasant and social with those immediately around us, forming lasting and intimate bonds with the wrong crew makes it much more difficult to bond with the right crew whenever we may find it. Another easy mistake to make is to confuse the benefits of having connections with an excuse to slack off in our own behavior. There’s nothing wrong with knowing the rulers in government or having friends and allies among them, and there’s no reason to hide these facts if they exist. We just can’t believe ourselves to be above the law or exempt from the kind of behavior that unity requires. Essentially, we must remember, no matter how high we believe ourselves to have climbed, even if we have done such climbing in a compassionate and righteous manner, we are not and should not be outside of the whole of the union. That is now, and must always be, the most important element of our daily and yearly perspective. The ideal state of freedom between government and its people is when those who support the leader or leaders are permitted to come close, while those who do not are permitted to go their own way and form their own unions and societies. When this is allowed to be the case (for this, here, is not a matter of implementing a policy but allowing a natural process to take its course), the bond formed by those who remain of their own accord is exponentially stronger for its existing in concert with nature and the heavens. There’s a basic lesson here, however, to be applied to our own lives, yes, here and now, and that is to adopt this philosophy—the purity of the benign ruler—towards those around us. People are always aggravating us by making their own decisions and doing what they want to do. Imagine the horror! But that is exactly what we must allow them to do. Let those who belong around us to come around us of their own accord. Let those who wish to go, go. But even with the help of these few bits of advice, failure is easy, which is why this kind of ideal and pure union is rarely seen, and perhaps never seen in the modern aeon. If the moment for unity comes upon us, for example, and we hesitate to recognize it or to surrender to it, the unity passes us by altogether. We will have missed it. Other times, of course, common bonds and shared experiences build up a strong people’s union with one another and with their complementary leaders, and those who rejected or were blind to it previously now seek to join. We will let them! But the laws of nature are such that there are always consequences to showing up late, and it will take a much greater amount of time for the tardy to catch up to the full union shared by those who have been together the entire time. Also important to remember are the demands of the position of such an elevated form of leadership. People who are great enough, consistent enough, mighty enough to assume such positions are, to say the least, uncommon. If you desire a position in leadership, or suspect you might be called into one, you really need to look within yourself and recognize whether or not you have what it takes. If you don’t, and you go try to become the central leader of the union anyway, the results will be so bad that it would be better if there were no union at all. On the other hand, if perhaps you know you aren’t cut out for the leadership, go out and find yourself an organic union to join. They are out there! It’s up to us to grow them…and to flow together with them. it up all over the web without my authorization. Do you know any techniques to help reduce content from being ripped off? Thanks so much for reading! I appreciate the kind words, the pleasure is all mine. and to this point? I surprised with the analysis you made to create this actual put up extraordinary. Thank you very much for reading and I greatly appreciate your thoughts! battle camp hack carries a huge purpose in National Culture. Many people is usually seen involved in actions associated with battle camp cheats. using this web site, as I experienced to reload the website a lot of times previous to I could get it to load properly. a great author. I will always bookmark your blog and will come back very soon.